Spiral Whisper Stamp Of The Week is this gorgeous Funky Snowgirl designed by Janet Roberts, you can purchase her for just £3.55 for one week only. Sorry I haven't been around much, I will catch up with you all shortly. STAMPS: Spiral Whisper. INK: Airondack Pitch Black. CS: Anita's, Doodlebug Designs, pattenred paper by Forever Friends. ACCESSORIES: X Cut Snowflake punch, Craftwork Cards Mini Message, Papermania Adhesive Gems, Copic Markers. 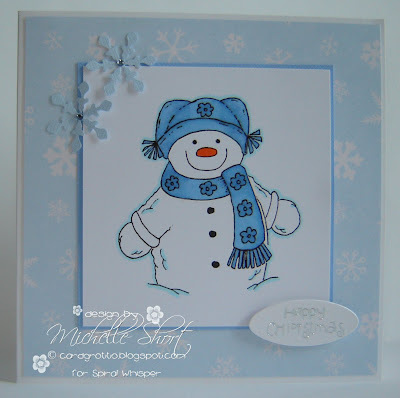 Ohhhhh Wow I just lurve this card Michelle - Mr Frosty looks so funky and the colours are just gorgeous. .... Whoops it should have read MRS Frosty! Adorable card! Love it! Love the papers too!